.... take it out of the inner sleeve before scanning. No serial number listed but I remember seeing the original auction. And they make zero mention to the ding in the bottom right hand corner. Maybe he stole the scan because he was too lazy to scan it in..
Great investigative work. Weird he would start it below his purchase price. Maybe we can catch a shill bid too?? Will have to watch this one play out. Weird that you mention this. 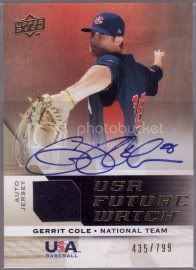 I purchased a gold auto of gerrit cole that was scanned in a bgs sleeve this offseason. It arrived w/o the bgs sleeve but had severe corner damage. It was obviously the 6.5 w/ 6 corners in the pop report cracked out because there is nothing else below an 8.5. A month or two later, the 6.5 surfaced on ebay. I looked at the scan of the card I purchased again and the sleeve appeared to be sealed. I wasn't able to figure out what happened.